I played 3 matches last night and enjoyed myself. I do kind of wish there was a solo mode I'd prefer playing alone while I learn rather then the pressure of playing with a squad. That said all the squad call outs and stuff work really well and make voice chat feel unnecessary so it could be worse. I want to like this game I really do. I've been interested in trying out this whole battle royale thing that's happening. And if there was one game that would do it it would be something with Titanfall pedigree. I think I'm just not a right fit for the kind of gameplay that BR games bring, which is sad for me. I like everything around this game. I would love a training range or something like that to test weapons and equipment (the training is super simple). The game is ok, but I don't think I'll be playing it in the long run...is more or less the same as any other BR. Is just me or some sounds are exactly like Black Ops? I really love and appreciate how fast it is to get right back into the game. I've always hated the typical waiting 60 seconds to get into a match plus the drop. ADS feels a little off to me and I think I just need to figure that out myself. Also, the grenade and health system is super annoying. I feel like it's an extra step too much to throw a grenade and heal. You need to press the button to take it out and left click to use. I just want to be able to use "g" for grenade and have it throw. I've gotten screwed multiple times on this. This is a lot of meat to this game and I am looking forward to playing this a hell of a lot more. Also, the grenade and health system is super annoying. I feel like it's an extra step too much to throw a grenade and heal. You need to press the button to take it out and left click to use. I just want to be able to use "g" for grenade and have it throw. I've gotten screwed multiple times on this. I died three times due to this. I'd be in the middle of combat, decide to throw a grenade and push 'G' as in every game. I take out the grenade... and just stand there... not doing anything. Until I realize I have to also "shoot" to throw it. At which point I'm already dead. Played one game so far so very early but I liked what I saw. I was immediately impressed with how loud and meaty the weapons sounded when trying them out on the practice range. That release of a timeline and what’s to come is a great move. A small detail I've noticed with the damage. When you hit someone it will show you the damage numbers in various colors. If the damage is purple they have epic armor on, yellow for legendary armor etc... If it's red then that means they have 0 armor and you're doing HP damage. There is also an armor break notification like in Blackout. We should probably acknowledge that @Respawn surprise-launched a multiplayer game—without a public beta!—to more than a million people, with only modest technical issues. When's the last time that happened? I am actually quite happy that it doesn't have wall-running and all that crazy stuff. I wouldn't be able to handle the speed of all that plus the character classes plus the BR-elements, etc. etc. etc. With all of that, I would need dedicated and verifiable "over 40 years old" servers for me to be competitive. 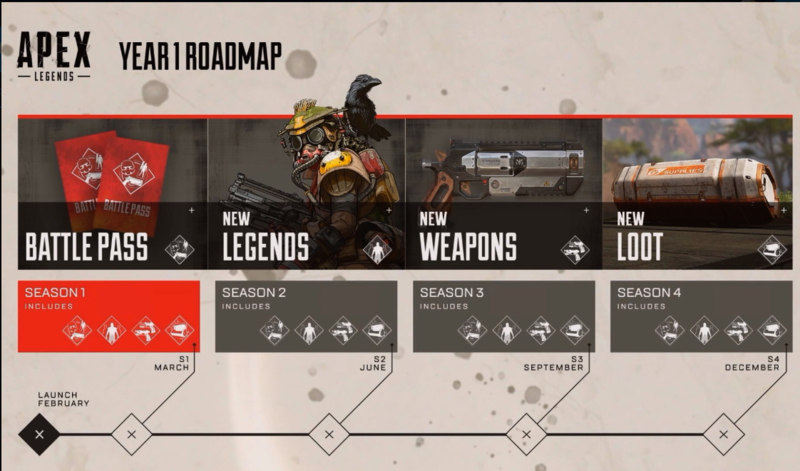 As it stands right now, I am really enjoying Apex Legends. I somehow missed that this was a Battle Royale game, so, even after downloading and trying the tutorial, I was expecting like an Overwatch/Team Fortress style game. Even in my glider group looking for a place to land, I was thinking I was just in a squad of three while part of a larger team. It wasn't until I actually saw an enemy, realized I didn't have any weapons to shoot him with, and started trying to punch the guy to death that I was like "oooh, it's one of those." I'm not sure how long I'll stick with this, but through maybe 5 matches I've had some fun. On my best round, I was down to 3 final squads but, assuming Gibraltar's ultimate was probably a defensive ability along the lines of his shield, I called it down on top of myself and died. Whoops! Yup there were 4 teams left and both of my team members died, I shot one of the people who killed my team and dropped an orbital strike down on-top of my team mates corpse killing the other two enemies. I quickly charged in to recover my team's banners and proceeded to die to my own drop. Was not expecting that although in hindsight I should have. Was a good match though managed to get us to top 3 and had 5 kills which is good for me in these types of games. Where the f*ck is our Star Wars game? As far as hooks go, "Overnite" or "Fortwatch" is a pretty good one. I might try out a few rounds tonight. My brain needs a break from all the homework I've been doing, this might be a good fix. For those that have played how hard do they push you to buy credits/keys/loot boxes? Not at all, unless you're dying to unlock the last two classes. I'm about 1/5th of the way to unlocking one after maybe three hours of play. I've played about 4-5 hours and am enjoying it more and more. I've even won a match with 2 of my friends and all 3 of us survived. Not bad for a game I didn't even know existed a week ago. I really liked the multiplayer in Titanfall so this was a nice surprise. Don't know for how long but they give enough space bucks to buy one of the two locked ones. I had a few games last night on xbone and it all works very smoothly. Most of the basics are straight out of other games but I got a bit overwhelmed with the amount of different stuff to pick up and rarely any time to see what it was all about. Not much of a chance to figure out any class stuff yet either. I think the colour coded bits and bobs will take some getting used to- I mean is a purple choke better than a blue one? Are different coloured scopes really any different? I have a hard time remembering the order of best colours. It's very busy with the noise of announcers and scripted team talk. Might be better to switch some of that off but occasionally it helps like letting you know where you are in relation to the circle. I agree it's a faff equipping grenades before throwing. Three kills and third place was by far my best game. I think it'll take a while to beat that. This came out of nowhere for me. Solid gameplay and fun... for free. What a pleasant surprise. PSA: You can link your Steam account from the settings panel. Should make grouping with friends a bit easier. Had a couple of bad runs last night. Early on a team member was downed pretty far behind me. I doubled back and found his loot being rummaged through by ALL THREE of the squad that killed him. All I had though was a slow firing shotgun. I took out one of them, but quickly got killed by the other two. Another run (where I was the drop-master) I got killed before I even found a gun. I lost most of my games last night while I was getting used to the controls. Not having the double jump takes a bit of time to get used to. While the movement is fluid, it feels sluggish compared to Titanfall 2. My last game we managed to survive and become champions just by waiting to kill off the last team. I still have yet to get a kill though. I feel that this game requires a full game session or two of just hot dropping to get used to fast looting, and combat. I remember in PUBG having to go through this to get used to how to the gun play and the tactics. After 5 or 6 hours of play I am still unsure how each gun plays out or where to expect people. This game has even faster movement then CoD Blackout so a guy that is in one spot, can easily flank you in 10 seconds if you are not careful. Anyone know of a decent guide for weapons/ammo/loot/etc? Boy, I am terrible at this game. Even more dishearteningly, I keep thinking I've done well only to find that I didn't? Last night I placed top 3 with my squad. I knew one member of my squad was clearly carrying us (he ended with like 11 kills) but I thought I was contributing! I fired shots with enemies that popped numbers off of them, and at one point, I circled around an enemy who was advancing on a teammate and shot him from behind and he died. Yet at the end, the score screen showed I had 0 kills and did something pathetic like 80 points of damage. I guess I just missed way more of my shots than I thought, and that guy I thought I obviously killed must've been shot down first by someone else. Frustrating! I like the feel of the game, I guess I'll just have to see if I get better after I've put more time into it. I'm really digging this. A lot of the pubs I've grouped with have been great/positive. This game seems to encourage teamplay more than most as I've never really had someone split from the team, causing issues for the entire squad. Is Discord the meeting place for groups these days? If so I'll try and catch some of y'all over the next few nights. Yesterday were like 4-5 voice channels in the GWJ Discord so I say yes, go to Discord.